Fall is the time of plenty. With a bounty of produce, fruit and nuts at hand, the biggest challenge is often deciding how to make the best possible use of it all. But it’s not an unpleasant task, and finding creative new ways to combine familiar ingredients can be its own reward. 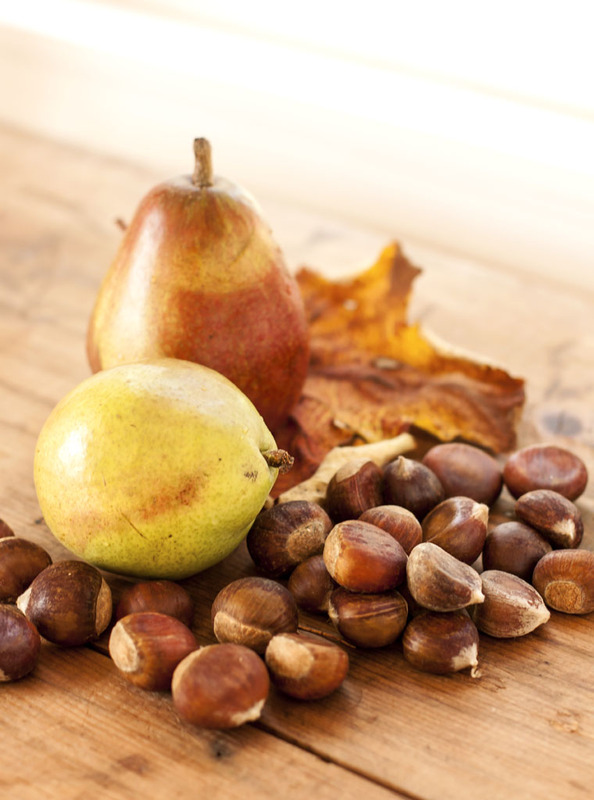 Pears and chestnuts are one such combination, but they go together quite well indeed. Both have interesting textures; similar, yet subtly different in unique ways. 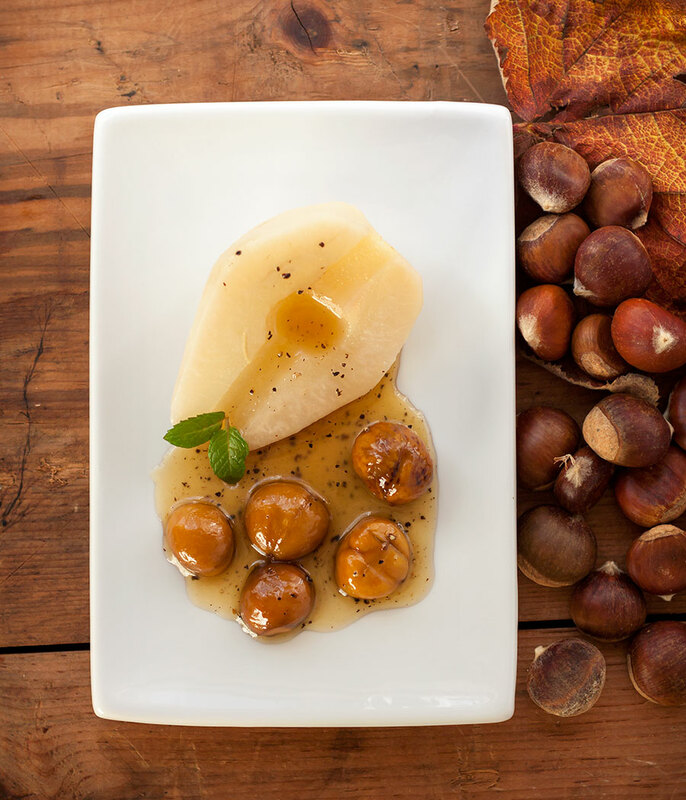 When cooked, both pears and chestnuts become softer, more tender, somehow more accessible. The rich, caramel-like glaze of maple syrup and butter is silky, sweet and decadently delicious, but perhaps a little predictable. A healthy spike of freshly ground black pepper adds unexpected spicy flavor and a bit of back-of-the-tongue heat – a surprisingly perfect counterpoint to the maple syrup’s sweetness. This simple, but elegant dessert is surprisingly easy to make. 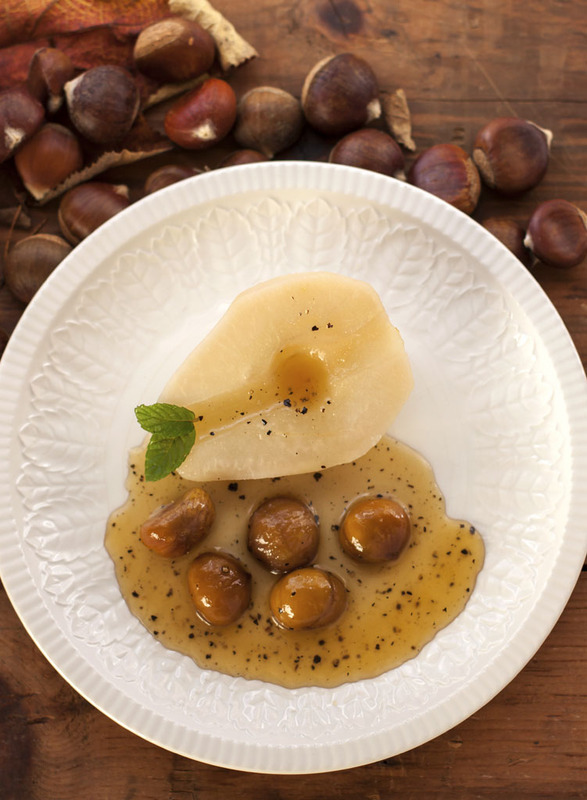 The recipe can easily be scaled up for a large dinner party and both the pears and chestnuts can be prepared a day or two ahead of time and kept in the refrigerator. Bring out the chestnuts and syrup an hour or so before serving to allow them to come to room temperature. Putting together each plate takes only seconds, leaving you more time to enjoy the party and your guests. Core the pears and peel. Slice lengthwise down the middle and scoop out the seeds with a melon baller. Add the lemon juice to a bowl of cold water sufficient to cover the pears. Place the peeled & seeded pear halves into the acidulated water. Add 6 cups of water to a pan large enough to hold the pears in a single layer. Stir in 1-1/2 cups sugar and bring to a boil. Add the pears, reduce to a steady simmer and cover. Poach the pears until they’re barely tender, just enough so the point of a sharp knife goes in fairly easily. Cooking time will vary according to the variety of pear and how soft you want it; some pears will cook in as little as 10 – 15 minutes, others will take 30 minutes or longer. Watch them carefully and remove them from the poaching liquid as soon as you think they’re ready. Remember that the pears will continue to cook and soften a little while they cool. Place the pears on a plate and set aside. When the pears have cooled sufficiently, place them in the refrigerator to chill. In a medium saucepan, combine the milk and water, add the peeled chestnuts, and bring to a boil. Reduce the heat and simmer until the chestnuts are soft and tender, about 20 – 30 minutes, depending on the size of the chestnuts. Drain, rinse under cold water, and drain again. In a large frying pan, melt the butter. Add the chestnuts, the maple syrup and the black pepper (if using) and cook over moderately high heat, stirring frequently, until the chestnuts are glazed and light brown, and the syrup is thick, about 4 minutes. Remove from the heat, stir in the vanilla extract and set aside to cool to room temperature. Place one chilled poached pear half on each plate. We sliced a tiny amount from the underside of each pear half to help them sit level. Arrange 4 or 5 chestnuts on each plate. Pour 1/4 of the maple syrup glaze over each pear half so that it pools around bottom. Garnish with a mint leaf or two if desired. This is by far the easiest and fastest method for peeling chestnuts that we’ve found yet. Cut a slit in the flat side of each chestnut with a small, sharp knife (a utility knife works quite well). Put the chestnuts in a saucepan, cover them with cold water, and bring to a boil. Simmer briskly for a couple of minutes, then remove the pan from the heat. Working quickly, remove 3 or 4 nuts at a time from the water with a slotted spoon and peel off their shells and inner skins. Once the outer shell is open, the chestnuts should pop right out of their skins with little effort. This works well when the chestnuts are very hot, but if they cool, you may have to heat them up again. 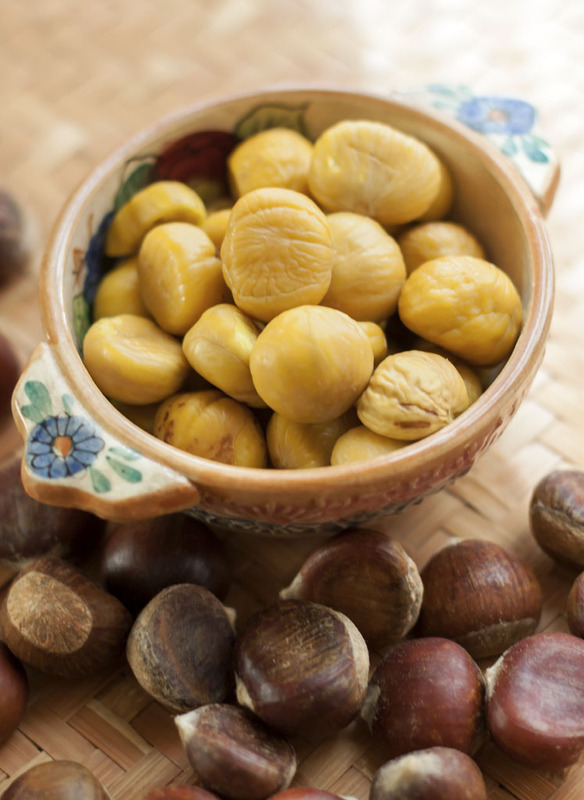 Set the peeled nuts aside and use in your favorite chestnut recipe. I steam my chestnuts in a rice steamer. I slice the chestnuts on the round side.